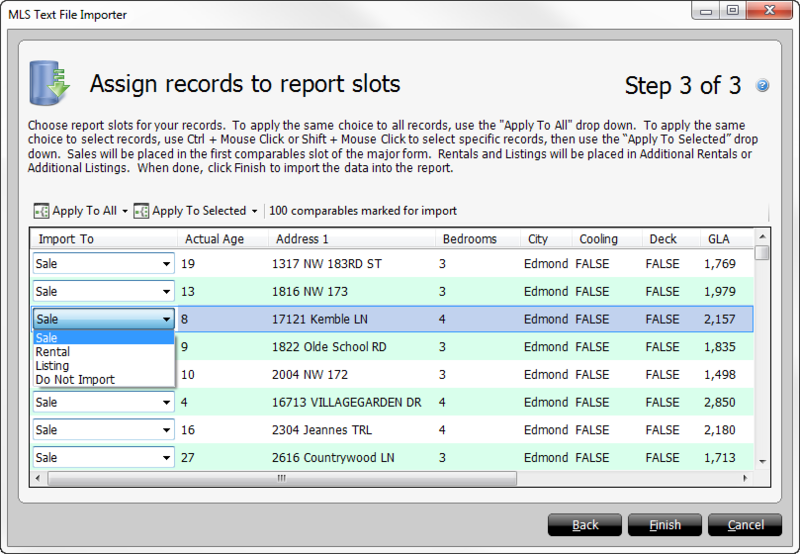 As such, it needs to know which type of property each record in your dataset represents. This is just a matter of choosing Sale, Listing, or Rental from the Import To drop‑down list. If you prefer for a record to not be imported at all, just choose Do Not Import. You may also use the Apply To All dropdown to set all properties at once. TOTAL imports your records into your file, starting with the first available empty grid slot. If your report template contains data in any of the grid fields, the importer skips that slot in favor of a truly empty grid. As such, if you want to replace existing properties in your report because you merged them from an old file and they're no longer relevant, simply clear the grid before you begin the import process.